Today I will just post pictures of some of the issues we found at the house yesterday. After the pendants were fixed, they began to drop. 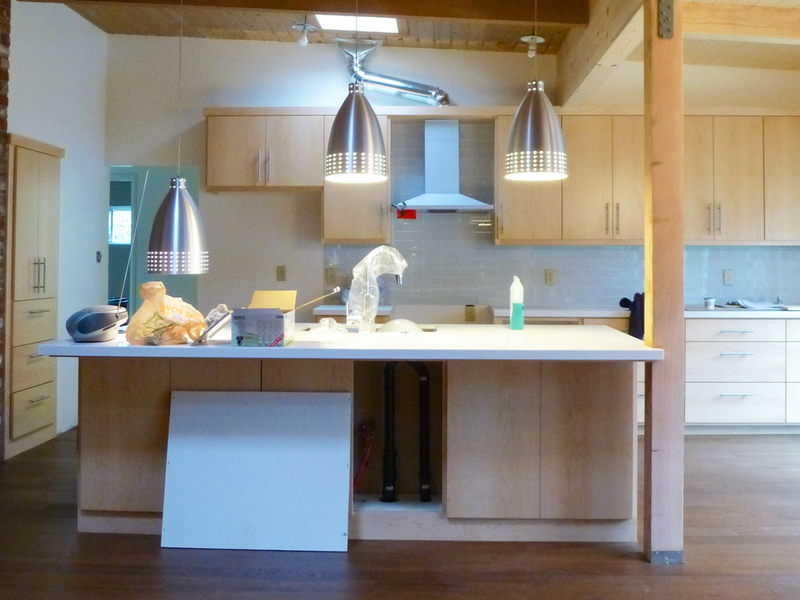 After we complained that the pendants were not even nor were they spaced properly, the lead electrician fixed them. This is not a fix. There are also holes in the beam where one of the pendants had to be removed and reinstalled so that they would be properly spaced. The pendants are also hanging too low. I told the electrician that I wanted the bottom of the pendants to be 7′ from the ground. Right now they are a little less than 6′. The lights over the counter are more like spotlights and do not illuminate the entire counter area. 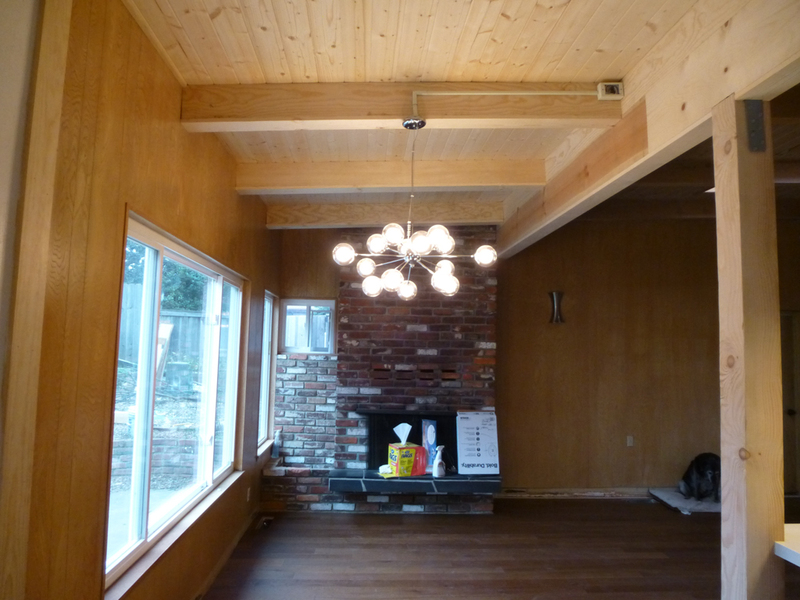 The light is supposed to be mounted between the beams so that it will be centered over where I plan to put the table. I’m not sure quite what to say about this. This was the old water heater closet. We installed a tankless water heater on the outside of the house and wanted to use this closet for a wine cooler (full size). The plug should have been installed on the wall because we cannot put the cooler in this cabinet with the plug installed this way. 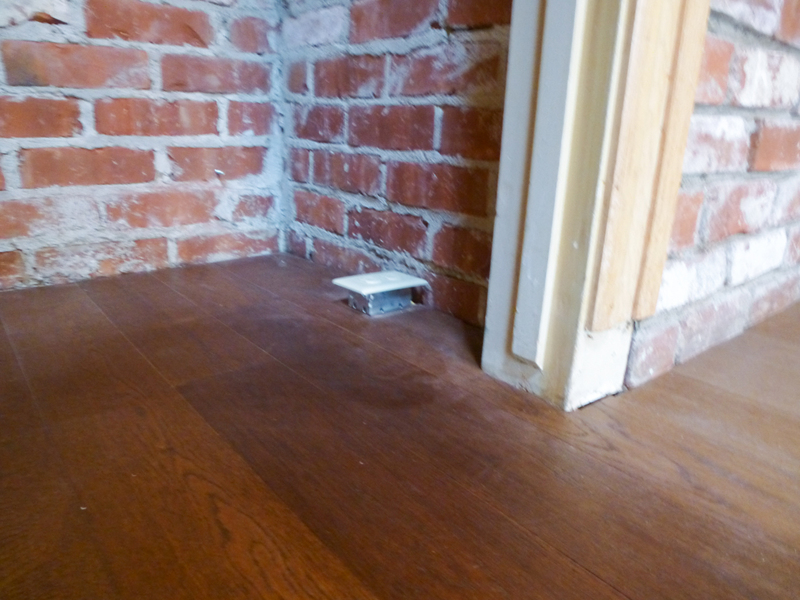 If it is reinstalled, we will have a hole in our wood floor. Although it won’t show with the cooler over it, if we ever decided to do something else with the closet, the hole will be there. In my last post, I showed the picture of the uneven , unmatched and downright ugly plug and switch that were installed on one side of our brand new, custom made island. On Thursday, the lead electrician tried to fix it with the above fix (left picture). It looks better than before, but still terrible. 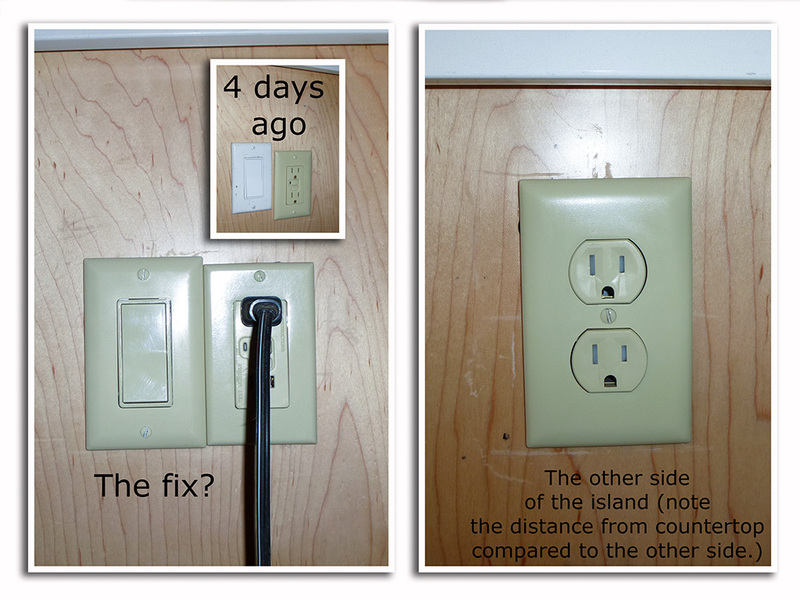 On the other side of the island, another plug was installed. All around the plug is marred and scratched. The plug is also at a different height than the one on the other side. The most interesting thing about this switch is that it turns on the pendant counter lighting AND one outside patio light. We have another patio light switch in the kitchen by the patio door. It turns on a different patio light. In the office, there is also a patio light switch which turns on one light and the pendant counter lighting in the kitchen. Outdoor walkway and deck lighting. I’m not sure about what happened here. When I spoke to the electrician on Monday, I told him not to replace the deck lighting as I didn’t think the light fixtures we purchased would fit. I also told him that I would be taking two of the lights back ($80.00 each). Although I don’t like the way the coils are snaked around instead of in a straight line, I would have lived with it considering everything else that is wrong. 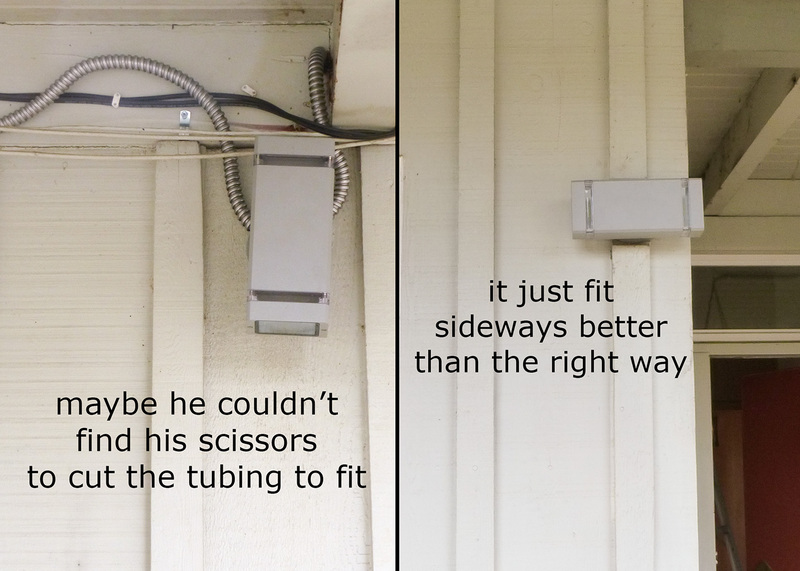 However, he went ahead and installed the two up and down lights on the deck. As I suggested, the light did not fit on the wall, so the electrician turned it sideways. When the light is turned on, it is like a laser beam in your eyes. And, now we cannot return them because he has destroyed the packaging. And now for the bathroom electrical. Aside from installing several fixtures upside down (they were reinstalled correctly), this is how the controls and the switches were installed in the main bathroom. 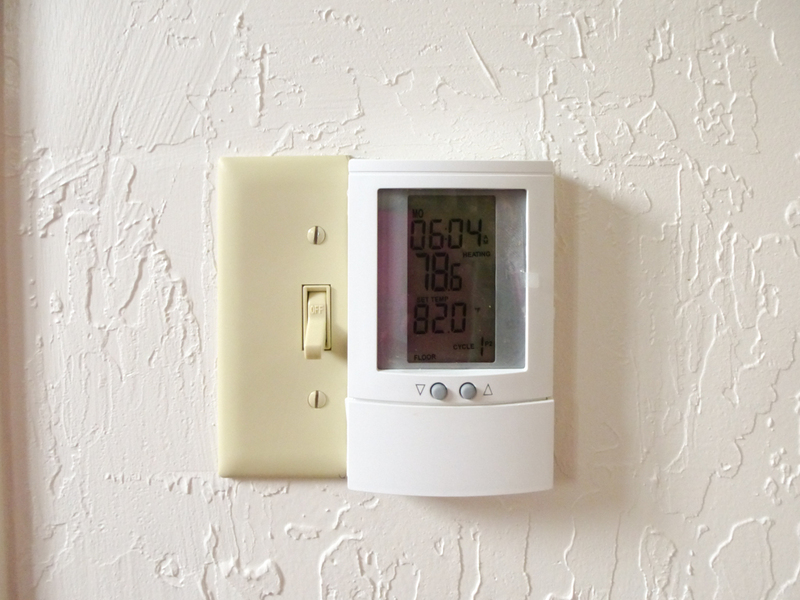 We have heated floors in the house we are living in now, with these same controls. The guy that installed them made a separate opening for the controls, which seems to be the best way to do it. The electrician for the MCM remodel tried to squeeze them both into the same box and so had to cut a light switch to fit. He did this in both bathrooms. Looks terrible. This switch also turns on the light over the vanity and the light in the shower. 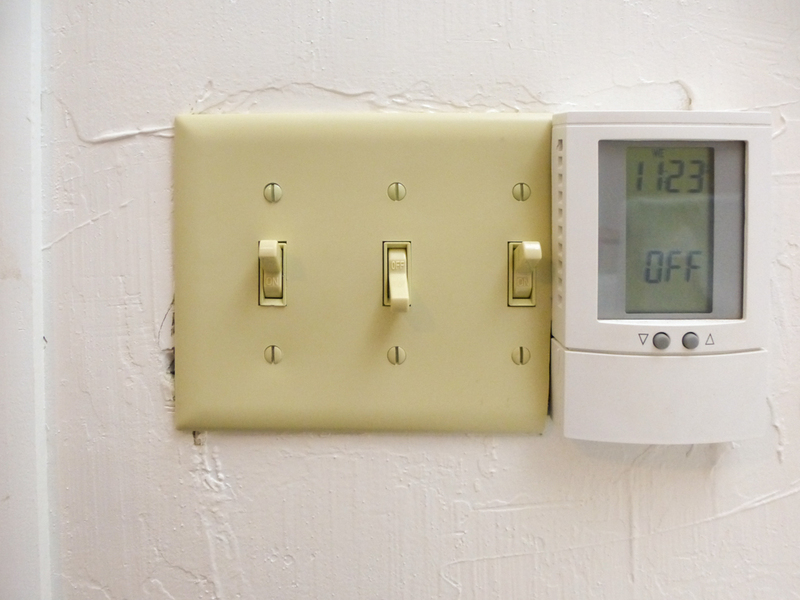 The double light switch near the shower turns on the overhead fan/light and the other switch turns on nothing. The fans in both bathrooms do not work. 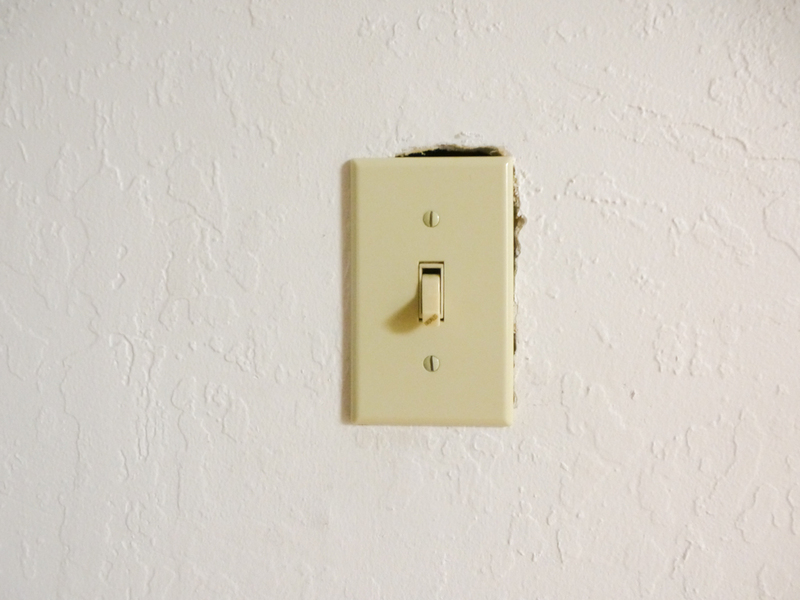 The odd thing about this switch is that it was already in the house. They did remove the switch to do something with the electricity, but all they had to do is put it back like it was…and it wasn’t like this. Aside from all this…there are numerous outlets in the house that no longer work. One of the things the electrician recommended was that we replace the main electrical box because it was outdated and may cause problems with some of the modern electronic equipment. Now, many of the outlets no longer work. I’m not ready to panic yet, but I don’t think I want this electrician trying to fix any of this. It’s time for our contractor to hire a new electrician. We may be moving back our move-in date of March 1. This entry was posted in Bathroom, cabinets, Electrical, Exterior, Finishes, Kitchen, Lighting, Snafus, Working with Contractors and tagged bad work, dealing with contractors, electrician, electricians, electricity, fixtures, light switch, lighting, panic, repairs, the electrician. Bookmark the permalink. I just simply have no words. my husband was a master electrician. He would turn over in his grave if he could see this. Why didn’t the project manager fire this electrician or his company at the first inkling of trouble. Even the fixes are not acceptable. I’m not sure why he continued to let this guy work on our project. The electricity has been a problem since the beginning. Wow. They are some pretty huge mistakes by the electrician. I feel awful for you guys. It always shocks me the lack of care that is taken by today’s trades. It’s as though they just need to get their job done and get out of there without worrying about how it looks or affects other elements of the job. We had similar issues with our renovation, although our electrician was probably the only guy we had confidence to use again! Definitely get someone different in to fix that up and I’m sure things can only improve from here! Thank you for the sympathy. I appreciate it. Only someone who has gone thru or is going thru major construction like this can really understand.